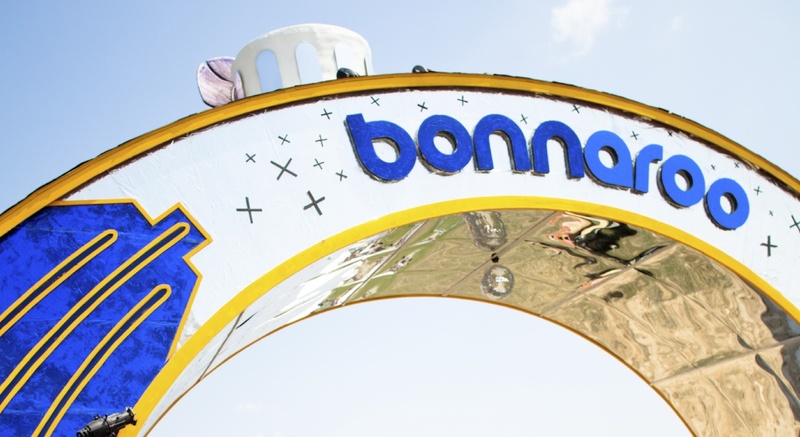 Huge Day for Bonnaroo. 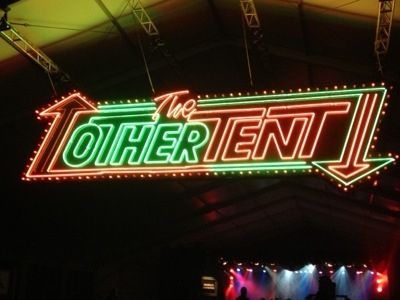 Ludacris, avett bros, Feist, St Vincent, Foster the people, radiohead, black star and Major Lazer are today. Stick around for updates. 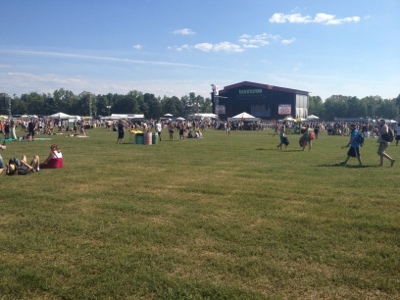 Both main stages are open and the crowd has spread out. It seems like they’re starting and ending earlier this year. Imnot sure what to make of it. 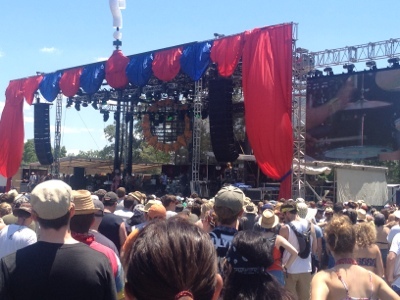 Catching bands at Bonnaroo at noon is a little odd for me. It’s warm, but not ridiculous. 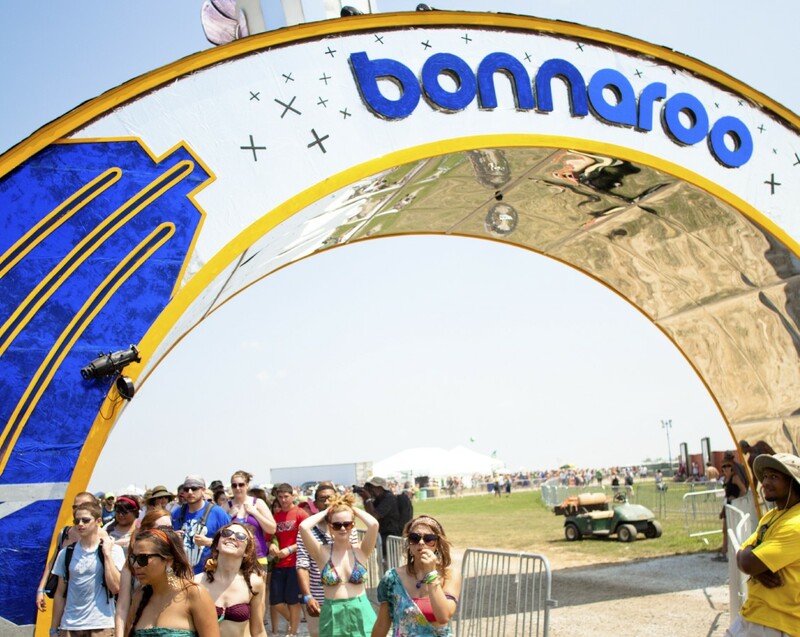 Still no hippies at Bonnaroo. It’s a bit sad. There’s a whole lot less of the peace and love crowd and I admit that I miss those dirty, loveable little hippies. 12:38pm: The Kooks. Meh. Huge crowd though. Evidently I’m missing something. 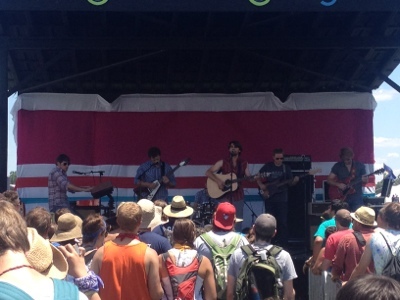 1:00pm: The Dirty Guv’Nahs at the sonic stage. Good rock sound a la The black crows. Local band from Nashville. 1:20pm: The Soul Rebels are on the main stage. New Orleans influenced jazz with heavy African drums and lots of trumpets. It’s not my style but I can respect the music. 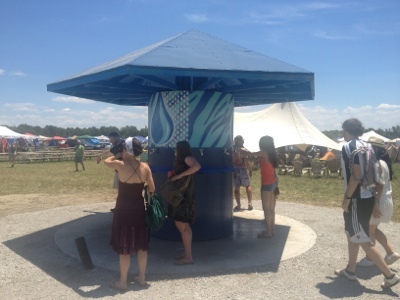 Bonnaroo has added several new water stations. The past two year have been incredibly hot. I think we caught a real break this year with the weather. 2:00pm: NeedToBreathe at Which Stage. Folks from little rock may know this band. They played the Rev Room last year. Jeff Matthews at B98 is really into them. They’re and acousticy Christian Band with a broad southern sound. Check out “Something Beautiful”. 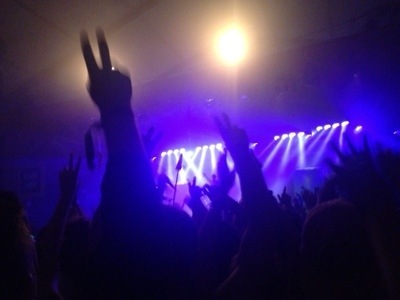 3:15: We caught Two Door Cinema Club, an indie rock band from Northern Ireland. Songs are fast paced filled quick, high-noted guitar riffs. Think Franz Ferdinand or Bloc Party. After watching two door cinema club, we caught the last of Sharon Jones and the Dap Kings. Great big band sound with a soulful lead singer. 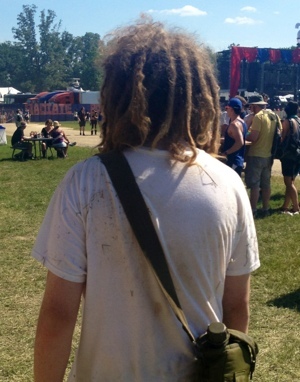 Also of Note, I found a hippie! Here’s proof! 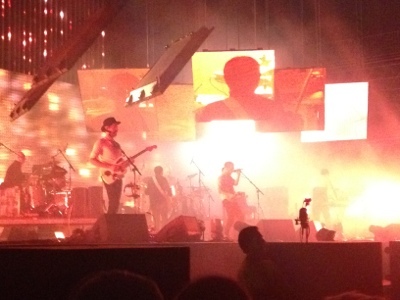 4:45 PM: Five hours until radiohead takes the massive What Stage. Avett Bros, Fitz and the Tantrums and Little Dragon all play at 5pm. I shall do my best to see all three. 5:00pm: The Avett Brothers are playing yet another solid performance. Having caught them at Wakarusa last week, I listen from a distance. 7::15pm: it was unfortunate that Ludacris and Fiest were at the same time. I caught a few Feist songs but I couldn’t resist watching Luda. It was a high energy show that wove samples of current popular songs in between Ludacris songs. it added a DJ element which added to the complexity of the performance. Rap shows are usually just a guy yelling over a soundtrack and Luda combined visual element which really gave it a shot in the arm. Afterwards I managed to see a few songs from St Vincent’s set. She’s a little woozy and atmospheric. It’s not my thing but I think she’s talented. 8:30pm: I couldn’t help but stop to see Foster the People. I’m not particularly a fan but I would imagine they’ll have a good live show. I plan on staying for a few songs and then going to get a good spot for radiohead. 9:40pm: Foster the people was underwhelming. I came to Radiohead to wait in line to get in the pit. At What Stage, the main stage, a line and gates form before the show, them before the show they lift the gate and the line pours in. It was pretty brutal but we made it. I’m one person away from the front rail. I might finally get some pics and videos worth looking at. 20 minutes until Showtime! Pics forthcoming. 11:30: Great RH set. They stuck with more of their psychedelic stuff. If you’re looking for stuff from the bends or Pablo honey, you’d be disappointed. As with any of their shows, the visuals were beyond impressive. 1:45am: Major Lazer put on an amazing set. Diplo and friends were in full effect with their Jamaican Dance Hall sound. While they threw in several beats and samples from songs, they played no full songs. A 3 or 4 minute of “keep it goin louder” would have been nice. The live set is made up of Diplo behind the DJ stand and two companions on the microphones. One is a Jamaican ragae artist and I’m unfamiliar with the other one. Diplo (former boyfriend of MIA and producer of her recent work), in his fashion, emerged in a grey suit and black tie. I was delighted to see him inset so much of his own style into the set. 2:55am: checked out umphreys mcGee again. I heard them at Wakarusa and still wasn’t impressed after a second listen. They’re a jam band and the people on drugs seem to like them. I’ve found a delight over at That Tent in a DJ called flying lotus. He mixes a very smooth house style with a few aggressive climaxes. No dubstep here. A little hip hop sampling and some trance elements keep the show going in between him showcasing his own beats and synths. He is cleverly mixing in samples of other artists playing Bonnaroo. He has been incredibly gracious to the crowd and expressed his appreciation for such a large turnout. A lot of these folks literally have no idea how many people like them and then they get a 2am DJ spot and a couple thousand show up. I imagine is a very surreal experience. I plan on hanging around until Big Frieda. From what I’ve seen on YouTube, he’s a drag queen that comes across as half RuPaul, half Madea. His show is supposed to be full of base and repetitive hooks (think three six mafia). This is the last show of the night. 3:15am: I stopped off at The Other Tent to see Ivan Neville’s Dumpstaphunk. They are a festival favorite. I’ve attend many festivals where they were playing yet never seem to catch them. Fun band! Funky Soul Music from new Orleans. 4:00: Big Frieda was just as expected. Repetitive lyrics about shaking bootys and going to the club. From my RV I can still hear him. 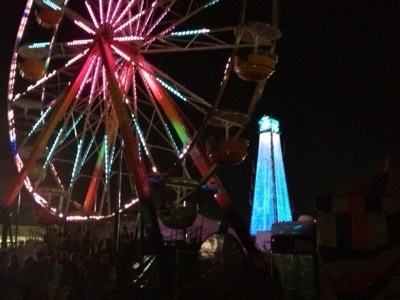 Bonnaroo really is a beautiful place at night. It turns into a whole other world. The weather has been great! A hoodie and pants were needed for tonight. The temperature is in the high eighties with a dry heat. This is dramatically different from past years and a welcome delight. Tomorrow will be another huge day and night. Skrillex and the Red Hot Chili Peppers will be huge.